hello, snappy casual readers! i am linley from dwelling & telling, and today kelsey and i are swapping blogs! she and i met through the 30 for 30 challenge back in the fall. we realize that while we each have our own individual style, we also share a very similar style—and the exact same blazer. so we’ve swapped blogs to show our own take on styling this blazer down for a casual look and up for a more dressy look. 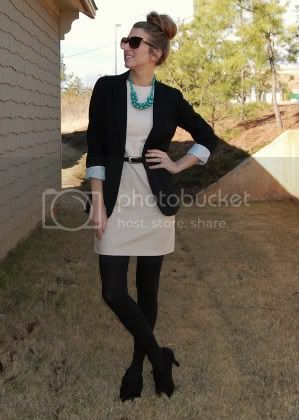 to see how kelsey styled her blazer, visit my blog and check her out! necklace: boutique in pawleys island, s.c.